The spice combination in Indian food is one of my very favorite flavor profiles on Earth. It’s warm and comforting and, simultaneously, bold and daring. The intricate layering of spices always has me in full admiration of the intuitive humans who created such a unique flavor combination centuries ago. 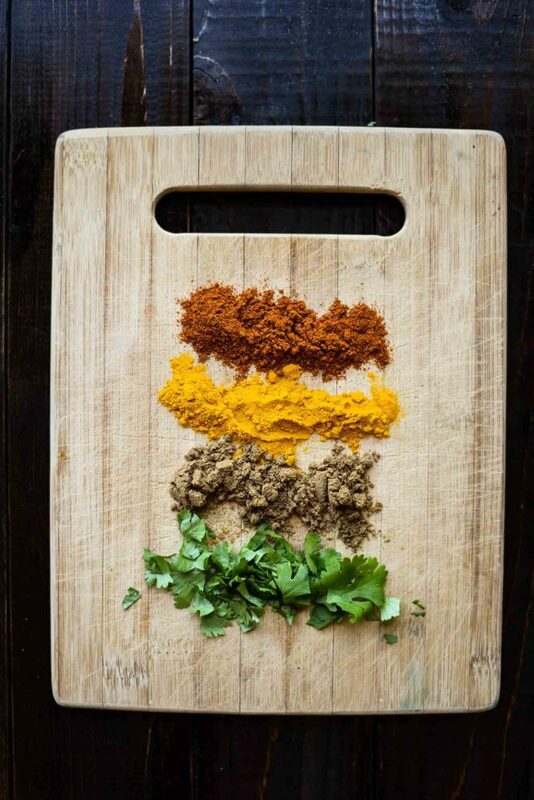 I marvel at the decision to pair turmeric, cumin, coriander, ginger, cinnamon, cardamom, garam masala, and cayenne. It’s food genius, pure and simple. This easy chana masala recipe is a vegan version of the classic. 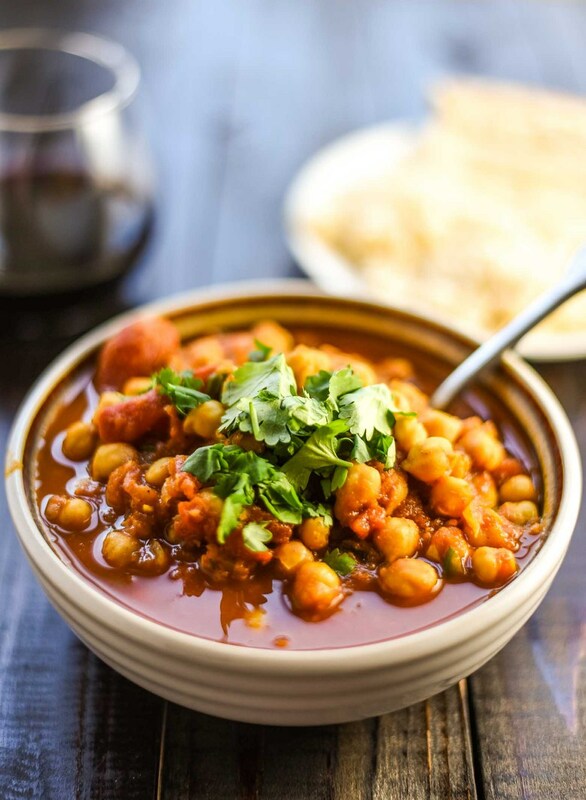 Chana masala is a hearty chickpea stew-like curry in a tangy, spicy tomato-based sauce. It has serrano peppers, onion, garlic, fresh cilantro, cumin, ginger, garlic, garam masala, coriander, turmeric chickpeas, and tomatoes. 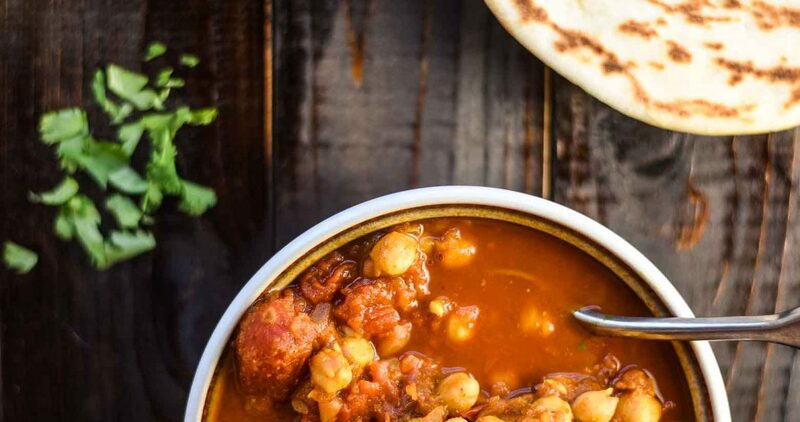 Cooking different types of cuisine can be intimidating if you’re unfamiliar but fear not – this vegan chana masala recipe is no sweat. As a bonus, the leftovers are even better as the spices continue to meld and join forces on team delicious. You can enjoy this dish on its own or pair it with rice or naan. If you’re feeding a big group or want to keep exploring vegan Indian food, this Vegan Palak Paneer recipe is a natural next step. 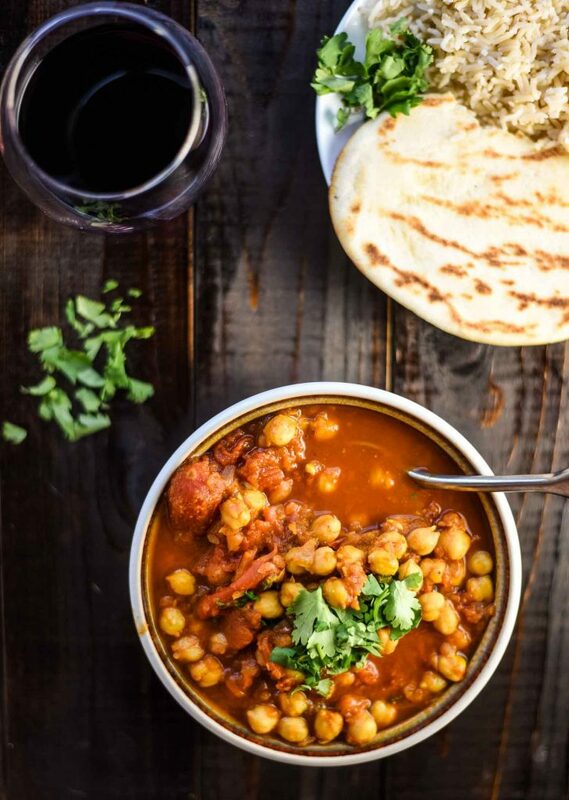 If you make the vegan chana masala, let us know what you think by leaving a comment and rating the recipe or taking a picture and tagging it #plantandvine on Instagram. 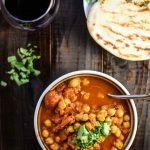 The key to pairing wine with this chana masala recipe is to respect the spice level by matching it with fruity wines that can be served cold. By doing so, you’ll complement the acidity of the tomatoes with the bright acidity of cool wine. Rosé: you can go still or sparkling here. The fruitiness is a good balance and the chilled wine will keep the meal’s spice in check. Gamay: if you want to go red, keep it fruity. Raspberry, banana, potting soil, and sour cherry deliciousness. Carignan: another fruity red with dried cranberry, baking spices, raspberry, and cured meaty flavors. Fruit forward with medium tannins and body. Easy vegan chana masala with stewed chickpeas, tomatoes, Serrano peppers, and a delicious spice blend. If you’re planning to prepare rice to serve chana masala over, cook rice (I recommend basmati) according to package directions.While rice is cooking, heat the olive oil over medium heat in large Dutch oven or pan. Once heated, add the onion, garlic, ginger and serrano peppers. Cook for about five minutes, stirring often. Stir in the cumin, garam masala, coriander, turmeric, salt and cayenne, and cook for two more minutes. Add the tomatoes and their juices. Use a cooking spoon or spatula to break the tomatoes apart. You can leave some chunks of tomato for texture. Raise the heat to medium-high and add the chickpeas. Bring the mixture to a simmer and cook for 15 – 20 minutes until liquid has cooked off to create a thick stew consistency. Remove from heat and add lemon juice. Taste to season, adding more salt to increase saltiness and sugar to balance the heat of the dish. Serve over rice or with naan bread if desired. Garnish with a lemon wedge and a sprinkle of fresh cilantro. Leftovers store well. Store covered in refrigerator for up to 4 days. *Recipe is a guide. Adapt as needed. Inspired by Quick Chana Masala by Cookie and Kate.